After over a year zooming around on a balance bike, this 3 1/2 year old tot took his first spin around the track on a pedal bike with no training wheels. It took about 2 minutes for him to get the hang of it! He is a bit small for his age, so stopping and putting his feet on the ground is a challenge. But he is so proud of himself! What a feat. Wouldn’t have been possible without all the practice on his balance bike this last year! What a busy holiday weekend for biking. I was at several parks over the weekend doing demo rides with the balance bikes. Kids of all ages and parents were out in groves riding bikes. I was so pleased – and alittle surprised to see several balance bikes around as well. These things are really starting to take off. I saw several different brands and different size children on them as well. One 4 yr old at the track was on a pedal bike (with no training wheels) and his little sister, who just turned age 2 was on a balance bike. I stopped to talk to their dad, and he said the older one started out on the balance bike and it only took 5 minutes to transition to a pedal bike since he had the skills he needed from all the practice on the balance bike. And they were both having so much fun! I heard a lot of parents confirm with me their frustration with tricycles as well. Either the kids have problems with pedalling, or they get tired of pedalling it after awhile and the parent ends up trying to carry the heavy thing! Alot of parents are deciding to skip the tricyle and try a balance bike instead since kids can now fit on balance bikes as young as 20 months (the Strider bike fits kids this age). So check these fun things out! Summer is almost here! Previous post: Summer is near! Get on your balance bike! 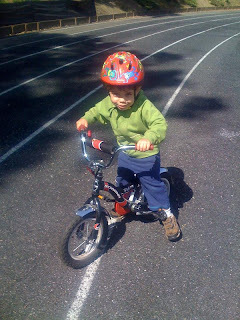 Next post: Balance Bike Coupon Codes!